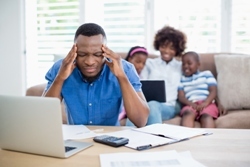 Tax problems with the IRS are always stressful and confusing for taxpayers. Without assistance from a qualified tax professional, it's almost impossible to resolve them promptly and fairly. At Mensah Finance Group, we embrace the challenge of working with the IRS to tackle all kinds of tough tax problems for our clients. Our Atlanta, GA CPA firm is well-equipped to resolve your tax problems and give you a fresh start with the IRS. We will negotiate with the IRS on your behalf so you don't have to deal with them directly. No matter what tax problems you're experiencing, our intervention will stop the harassing letters and phone calls while we work out a reasonable plan like an Offer in Compromise or Installment Agreement to pay off your tax debt. Whether you're dealing with back taxes, wage garnishment, tax liens, payroll tax problems, or other issues, we WILL find a solution. Mensah Finance Group is proficient in solving IRS tax problems for businesses and individuals. Call us today at 678-821-2950 or request your consultation online now.